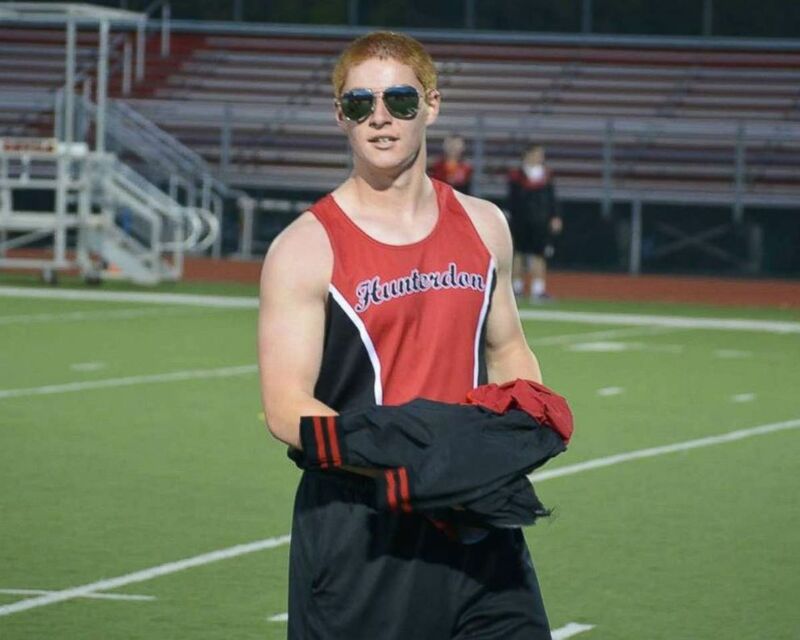 Video of Penn State fraternity pledge Tim Piazza chugging vodka, beer and wine at a pledge ceremony inside the Beta Theta Pi house the night he fatally fell down the frat’s stairs was shown in court today. Twenty-six men are facing various charges in connection with Piazza's death, including involuntary manslaughter, hazing and conspiracy, though aggravated assault charges were recently withdrawn. A hearing is underway today to determine if there's enough evidence to go to trial for several of those men. On the night of Feb. 2, 2017, Piazza, a 19-year-old sophomore, participated in an alcohol-fueled hazing ritual at the frat house. Fraternity members did not call 911 until the morning of Feb. 3, about 12 hours after Piazza's fall, according to a report on the grand jury's investigation. Beta Theta Pi fraternity house at Penn State. In the video shown in court today, pledges, as part of the ritual, are brought into a basement room and instructed to sit on a bench. They pass around a bottle of vodka which travels up and down the line of 14 pledges three times. Piazza is identified as the 9th pledge in line in a suit and tie. Piazza's parents left the room before the video was played. Pledges are seen on video playing beer pong, and every time a pledge misses a shot, he is handed a beer to chug. Piazza at one point is seen stumbling and staggering. 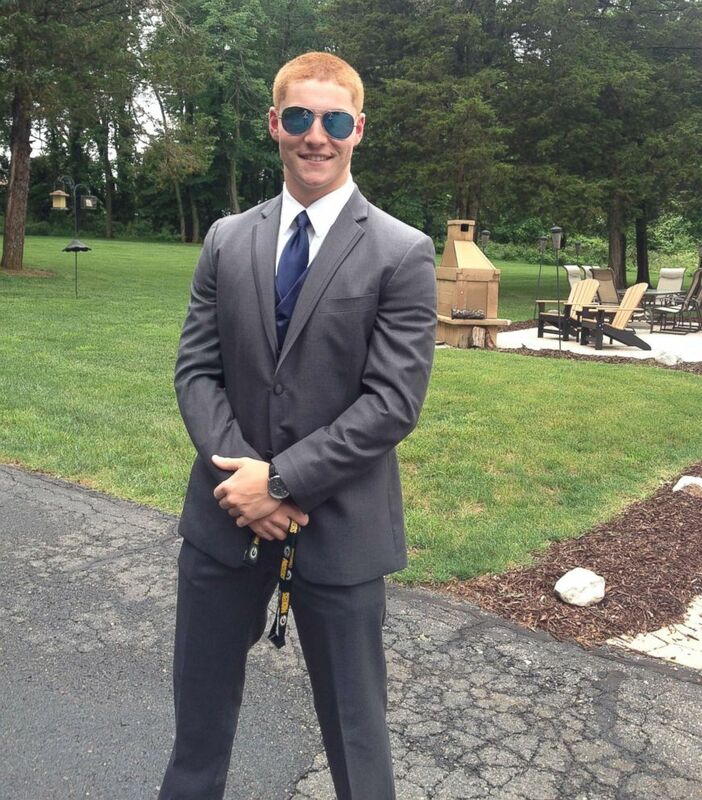 One defense attorney, Rocco Cipparone, said after court, "[The basement video] clearly exhibited a party, a social event, not a hazing event. It looked to me like voluntary drinking among people that you would expect to see at any fraternity party or sorority party or most college parties probably." Another defense attorney, Michael Engle, said, "All we're seeing from the prosecution is the same theory as before ... There's nothing really new other than the basement video. We didn't see any substantive evidence that changes any of the legal theory and based upon what the court received today, the decision should be the same as last time that there's insufficient evidence on the involuntary manslaughter." After court Piazza family attorney Tom Kline said, "For the first time we saw the basement tapes which had previously never been seen in public." "The scene of these young pledges walking single file into a room, being put into a lineup where they needed to drink alcohol and be marched out like prisoners of war from the room, only to face one more shot of alcohol, only to face one more round at the wine station, to face one more round of the beer station," Kline said. "It was just remarkable to see this chilling video taking place on a college campus." About an hour after the obstacle course ends, Piazza can be seen chugging from a bottle of vodka. Later on the a heavily intoxicated teen staggers toward the basement stairs, but his fall was not captured on video. Members of the fraternity carried Piazza up the steps and put him on the couch. They dumped water on his face and slapped him in an apparent attempt to wake him, to no avail. When one pledge tried to intervene, insisting they get Piazza some help, he was shoved into a wall and told the brothers had it under control, the grand jury report says. As the night went on, Piazza tried over and over to stand on his own, falling each time. The video in court today showed Piazza at one point crawling on the floor and putting his head between his arms on the floor. At about 10 a.m., fraternity members found the 19-year-old back in the basement lying on his back, breathing heavily and with blood on his face, the grand jury report said. One brother said Piazza's eyes were half open and he felt cold. Men carried Piazza's unconscious body upstairs and placed him back on the couch, where they shook him and tried to prop him up, according to the grand jury report. At 10:48 a.m., a fraternity member called 911. Prosecutors claim the frat brothers then tried to cover up the alleged hazing and underage drinking. One former fraternity member allegedly texted his girlfriend "drink hazing can send me to jail," and "I don't want to go to jail for this,” prosecutors said. "I think we are f-----," he added. Another text read, "Make sure the pledges keep quiet about last night and this situation." Beta Theta Pi has since been barred from Penn State. 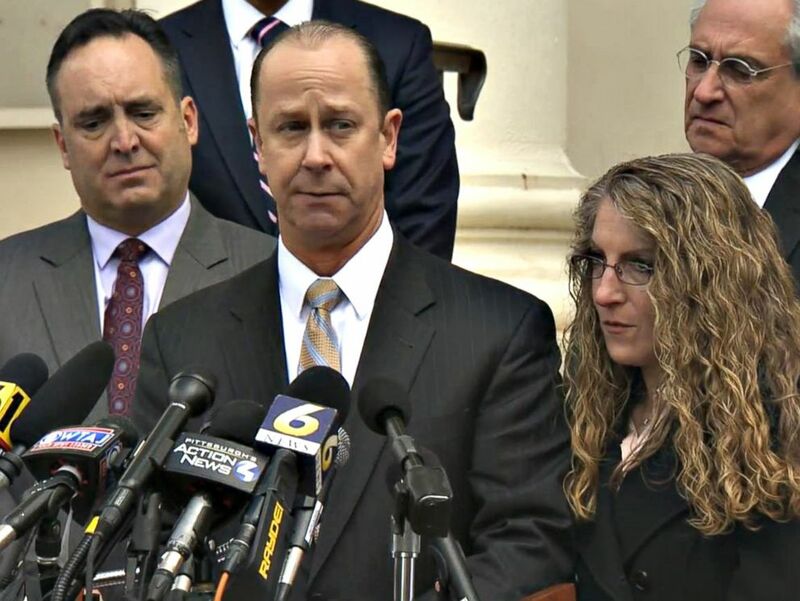 Jim Piazza addressed the media with his wife Evelyn Piazza and Pennsylvania Senate Majority Leader Jake Corman, left, on March 23, 2018, in Bellefonte, Pa.
Last week Piazza's parents joined with a local state politician in announcing a new anti-hazing bill in the hopes to "change the landscape" in Pennsylvania and become a model for the nation. Jim Piazza said he thinks the state bill -- the Timothy J. Piazza Law -- could make Greek life safer, hold those who commit hazing accountable and save lives. ABC News' Tom Kelly contributed to this report.